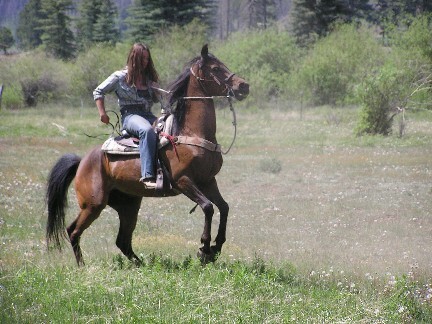 Erin, her horse Rua Badra, mule Yoakum and dog Ledoux are riding north up the Continental Divide Trail. Erin sent the following note of warning to The Guild in June 2007. The Trail is still under construction, and unless the horse community becomes more involved, equestrians are going to be left out in many sections. The United States Congress designated it as a horse and hiker trail, but some of the agencies, the BLM in particular, are ignoring that. Sections are being designated that are impassable to horses (the Zuni-Acoma trail in El Malpais National Monument and the Mesa Portales ascent near Cuba, NM) and "walk-through" gates that do not allow stock to pass are being installed along sections of the trail. This trail is a potential Long Rider's dream, and I hope that the Long Riders can help to keep it open to our stock/"
For more information about Erin's ride, please visit her website.